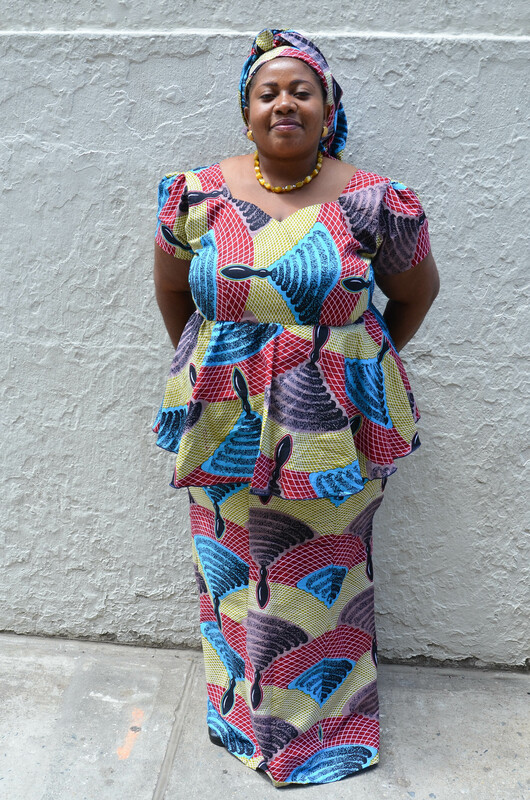 Today we are in conversation with Grace Nukunu, a participant from the GIFTED program. GIFTED, part of the larger Ghana Wins! project, is a professional development program that aims to build capacity in women leaders in education. GIFTED began in June 2013 and is a partnership between New York University, University of Minnesota, the University of Education Winneba, and Mujeres for Africa, sponsored by Banco Santander. GIFTED’s mission is to strengthen the leadership capacity and visibility of female educators as leaders within the Ghanaian education system. In doing this, GIFTED Fellows are better positioned to produce a systemic change in the local schools and at the regional education office level. The GIFTED curriculum seeks to provide these leadership skills so that GIFTED Fellows can actively participate in the decision-making processes, act as role models for other women and girls, and mentor other women. GIFTED provides professional development, on-going support, and leadership training to cohorts of 12 women educators. Teachers who are selected for this program participate in a year-long transformational leadership curriculum and they develop and implement action projects that support education outcomes in their schools. Can you tell me about your background? Where are you from, what lead you to teaching, and what do you teach? I hail from the Volta region of Ghana and am the youngest of four. I now have two children of my own with my husband Johny. I have always had a passion for teaching, starting when I was little. I find great personal satisfaction and comfort in teaching and enjoy being able to share what I have learned with people and having an impact. I now teach home economics and social studies at the New Winneba Junior High School located in the Effutu municipality of Winneba. How did you first hear about the GIFTED program and why were you interested in participating? I first heard about the GIFTED program from my headmistress who was looking for a partner to attend a workshop when the program was introduced to our municipality. I was interested because the program focuses on women and girls. I am a strong feminist and have a passion for programs concerning girls. Can you describe your project to me? How did you come up with it? What were or are you hoping to achieve? Our project is basically about bringing girls of school-going age to school from and around the community in which the school is situated by using cultural performance – music and dance. We came up with this when we realized that girls in and around the school community were seen hawking goods and selling things nearby when school was in progress. Though many attempts were made to convince both parents and girls about the importance of learning, they proved futile. Parents preferred that their girls sell things to make money or take care of the family rather than go to school. Particularly the elders believe that the right place for girls is to be home, cooking and taking care of the home. 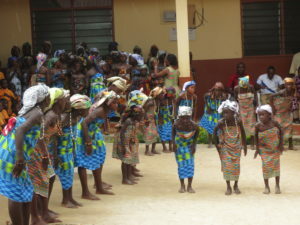 Therefore, when GIFTED was introduced, we picked cultural performance (music and dance) as a means to entice these girls to school. Basically our goal was to bring all girls in and around the community and even beyond to school. Also, we had a vision of girls outnumbering boys in the community school. We also had the dream of empowering girls in terms of academic performance as well as standing up for themselves when the need arises. We wanted to boost their confidence level. What do you personally gained from the GIFTED experience and how has it influenced you? The GIFTED experience has been absolutely amazing. Aside from working with knowledgeable and kind hearted people from NYU, I have come into contact with my colleagues from the same municipality who I was not very close to previously. We have become a big GIFTED family. Furthermore, I have: acquired great leadership skills from the NYU team; gained confidence in my dealings with people; become acquainted with a lot of people; gained exposure (traveling to NYU); gained so much passion for the education of girls or anything that concerns the welfare of girls. I understand that you created and then have been able to maintain the Girls of Difference Club and that it has increased girls enrollment in your school 130%. Is that correct? What does the club involve? Beyond increasing enrollment, how else has it been empowering for the girls in your school? The group Girls of Difference was created by Martha, my headmistress, and I. It started in June 2013 with 56 girls and grew steadily. As of June 2016 there are 186 girls and counting. This increase did not happen overnight. It has been a gradual process, involving lots of dedication and great moral and financial support from the NYU team, the University of Education, Winneba team, and the GIFTED family. The club meets twice weekly after school to either learn new songs and dances or rehearse the old ones. Lately we have shifted from cultural dance to contemporary music and dance. This has set the school ablaze. The fever is just too much to handle. The club also does reading literacy on one of the meeting days. We focus then on teaching the girls how to read and they read very well. The club also meets to discuss certain issues that pertain to girls and their wellbeing. This can be in any form – psychological, financial, moral, physical, spiritual, and can include discussion of abuse or other issues that trouble our girls. This gives the girls a sense of belonging and peace and better enables them to study. It has also given the girls a lot of confidence knowing that they have teachers on their side. Because of Girls of Difference club, the school land which has long been in dispute between two towns and two chiefs has been resolved. This happened when we held a GIFTED durbar in our school inviting the chiefs. Using cultural dance, our girls communicated to the chiefs through cultural display telling them they need peace to learn and become responsible women. Since then, the two chiefs have united and settled their differences. Later, the chiefs told us that they were touched by school land by cultural performances hence they have extended our school land by several meters. The chiefs have also allocated parcels of land to teachers who are willing to build in the community at a whopping 50% discount. Because of the GIFTED program, the chief has connected the school with bore-hole water all the way from his house to the school reservoir. A big parcel of land has been given to the school to do a garden. The seeds and other materials have been provided by parents. Products from this farm are sold out to the community while the rest is enjoyed by the school children. Also the awesome way our girls passed their final examinations. The most awesome things ever – ready attitude of parents and the entire community to willingly support our school and this is all because of the GIFTED program. In all, I can say the ripple effect of the Girls of Difference club is just so cool. What do you see as the next steps for the Girls of Difference Club? For your school? For you personally? To generate funds to keep the club going by performing at functions or ceremonies. We see our club producing intelligent and knowledgeable women for Ghana. 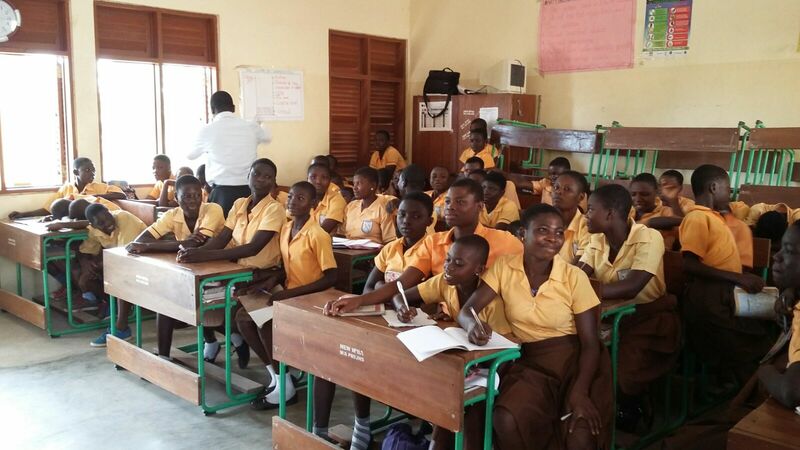 It is said, “if you educate a man, you educate an individual but when you educate a woman, you educate a whole nation.” We are educating girls and we are educating our nation Ghana. We are also helping out with schools facing the same problems to overcome as well. We are now a “model” school. Personally, I have never done anything so fulfilling in my entire life. We have transformed lives and watched a dormant community turn into an active one. I have seen disputes and rivalries turn into peace and development. I have been transformed totally. I am now a bold leader, a go getter, confident and self-motivated. The next step for me is to make the club bigger, brighter, and better through any means possible. Girls of Difference – we will fight for our future! ← Focus on Ghana: Ghana Wins!